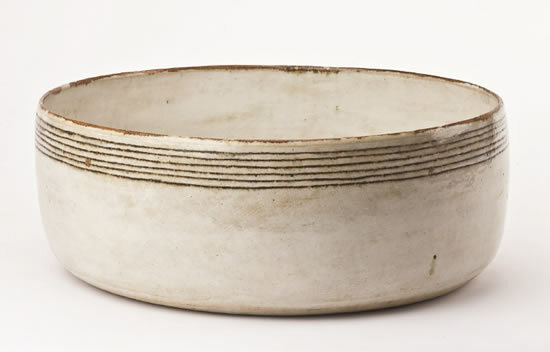 Gertrud Vasegaard is the great Danish ceramist of the 20th Century. In Denmark she was recognised again and again and awarded many prizes. Privately she lived a very quiet life - like a Zen-Buddhist - from 1969 alone, together with her daughter the ceramist Myre Vasegaard (1936-2006). Her art, however, was just as generous and subtle as her daily life was austere and modest. 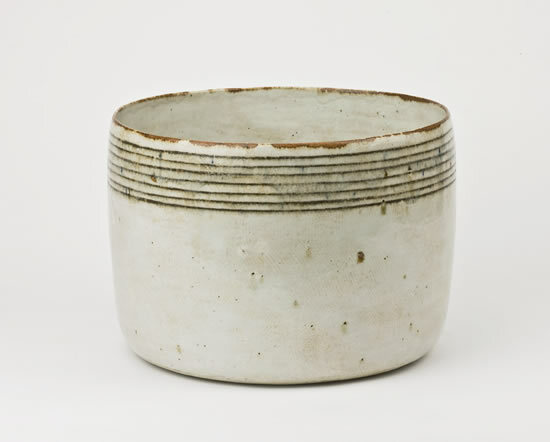 Her ceramic work – an art pure and strong – equals a level as high as that of Lucie Rie and Hans Coper. This first ever solo show outside Denmark will be, to many, a revelation and an astonishing discovery! Bowls, vessels and other traditional forms created by Gertrud Vasegaard in stoneware, with such personal integrity and magnetism, make the surrounding rooms vibrate with their own emptiness. Her works just stand there – mild and majestic – with great serenity. But a unique work of Gertrud Vasegaard only reveals its subtle depths slowly. There is a greatness and nobility embedded in the simple, sophisticated, and textural. Form, decoration, body and glaze always unite, giving each piece a silent, warm mental plenitude. No loudness is to be registered, only dynamic rest – like "a Chinese jar still moves perpetually in its stillness" (T.S. Eliot). 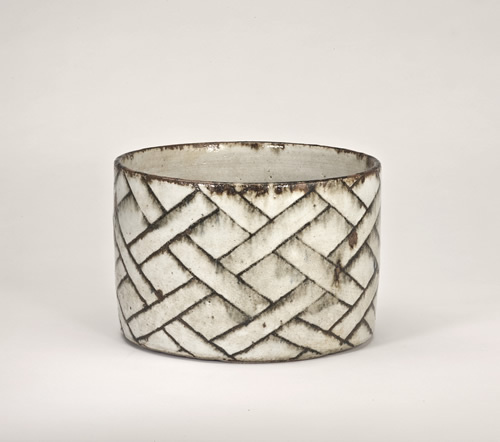 Each piece stands tangible, down-to-earth, the stoneware mass can be felt in such a way that the textural effect of the material comes into its own. Decorations might look as simple ornaments, engraved, painted, or pressed in contrasting colours, but in fact they are part of her artistic way of celebrating our existence. She was no ceramic rebel; but a master of the craft and an artist who was also a poet. Art is the craft of the mind. The art of Gertrud Vasegaard is obviously connected to the abstract movements of the visual art of the 20th Century, but it is also of a timeless character. Her works reflect the light, almost dancing with it, but never absorbing it. Gentle tones of grey and white, however the works are never monochrome. Her restricted palette has delicate modulations of umbers, siennas, whites, greens, greys and blues – not unlike the works of the famous Danish painter Vilhelm Hammershøi. Gertrud Vasegaard wanted light to reflect an openness and spiritual feeling of benevolence. Technically, she achieved triumphs in making lightly crackled glaze that shine – almost like the famous “Ru ware” from the Northern Song Dynasty made between the years 1086-1106. Her use of lines is special too. The visual movement is upwards. Abstract triangles, quadrangles, spirals, stripes, and rectangles are seen on her forms in perfect harmony. 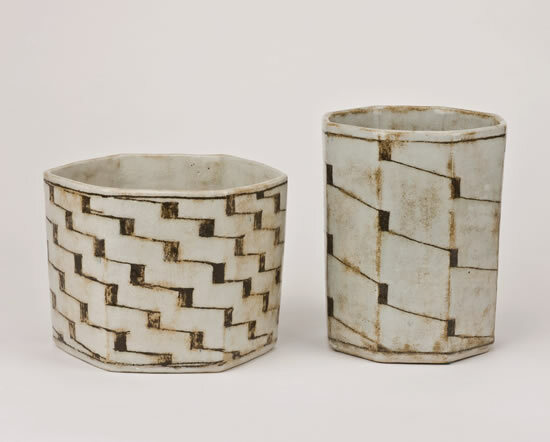 She actually has made the use of the line a speciality in Danish ceramics, using the line as controlled energy and a formative element in the individual work. Form and decoration melting together in a unique way. Lines bring elements together: base and top, the movement of the eye and the three-dimensional form. The "kumme" form has been one of her most innovative ceramic cylinder forms with upward moving lines – giving a stronger sense the "turning" of the cylinder. However, they are also part of a story of well organized "dividual" lines. Giving a spiritual expression to each piece of work, dividual and individual elements, are interconnected in a way that recalls the work of Paul Klee. Even Anita Besson was not able, years ago, to convince Gertrud Vasegaard of the fruitfulness of a solo show abroad. That is why this exhibition is something special. Gertrud Vasegaard wanted to concentrate on making new bowls, vessels and her masterful "kumme" cylinders. It is only now that we can get a full evaluation of the unique strength and importance of her achievements. During her lifetime only one retrospective exhibition was to be organized in the Danish Museum of Art & Design (Kunstindustrimuseet) in Copenhagen in 1984, followed by Stockholm and Holstebro. Some of her most beautiful and important pieces were made after this exhibition and have yet to be widely seen. In the summer of 2011 a second retrospective will take place at the "Holstebro Kunstmuseum" and at the "Bornholm Kunstmuseum" in Denmark. She is represented in public and private collections in many countries. Although she participated in the international breakthrough of “Danish Design” during the 1950s and 1960s and became known worldwide inside the craft world, she never wanted to look for international reputation and honour. However, more than just being seen as a member of a local craft movement, she should be recognised as a great artist. Gertrud Vasegaard had a meditative way of working and living, with warmth and humanity at its core. No wonder, she also had an objection to being quoted. 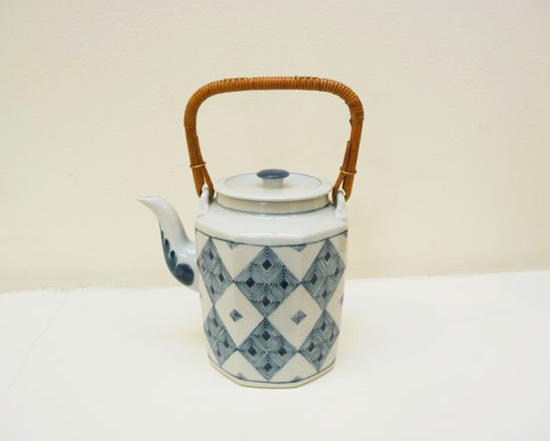 She worked as a ceramist from the 1930s till the beginning of the 21st Century. Many of her most important works were shown at the "Martsudstillingen", an exclusive group of fine artists with whom she exhibited from 1969 to 1982, and later at "Den Frie", in "Clausens Kunsthandel" in Copenhagen and in "Galleri Profilen" in Aarhus. The quality of her work was steadily improving until she stopped working in 2003. In a masterly manner Gertrud Vasegaard has used colours, clear forms and lines, and simple but subtle decorations to create the greatness of silence, a suspending of time; yet her works seem pregnant with the potential of endless becoming. Professor (in political science) at Aalborg University, Denmark. Author of Danish Art History from 1930 to 1995, and a forth coming biography of Gertrud Vasegaard. A fully illustrated catalogue is available, please contact the gallery for details.